The one DVD in my collection with an O title did not entice me this week, so I went to Amazon Prime to watch the first episode of Oz. 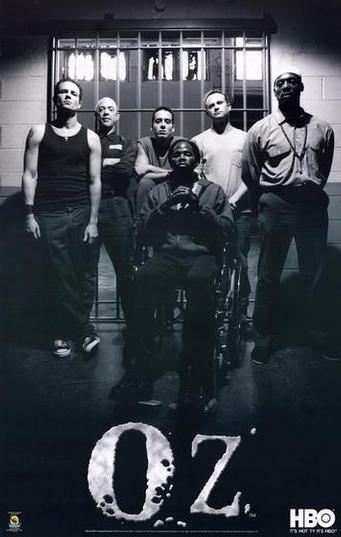 Synopsis: An experimental unit of the prison mixes lifers and members of rival diverse groups, with a goal of helping them learn to be better humans and not recidivate. Also, there’s a really good cast throughout the series. That’s important to know. Why I chose this film: I did not have HBO when it aired, so while I’ve heard people talking about it for years, I’ve never seen anything. Additionally, I work in the prison system, so I have some interest in the topic, though I often put off watching anything prison related because they never get it right. This post is only about the pilot ep, mind you, so I cannot speak about the entire series. But what I can say is that I’ve never worked in a maximum security facility (but I know quite a bit about my states prisons due to hearing about them from staff, friends who work in them, and from my inmates) and admittedly this series is 20 years old now but… no, just no. I work with lifers and guys getting out in a few months- i.e. a facility that mixes them- but inmates have to sign off that none of the gang/segregation stuff will happen in our facility (not saying that it doesn’t still happen, but it’s miniscule- and we have 5 times the number of inmates, minimum). So first off, in order for this experiment to have had a chance all the segregation would not be occurring. So… basically, I had a hard time not yelling “OMG, are you guys stupid?” at the TV. Will I watch it again: I’m not saying that I am going to sit here and work my way through the entire series today (Stewart would be mad at me because I have several things on my DVR that he is trying very hard not to spoil for me) but I think I’d like to see if I would still yell at the TV in later eps. Why you should watch it too (or run far away! ): It is not for every one. In the pilot ep there were multiple racial, sexist, homophobic, angry, hateful moments. But it was interesting enough that I plan to watch the rest of the series.